After the church service – filled with all the traditional hymns – Grace participated in the egg hunt and bubble blowing at Trinity. 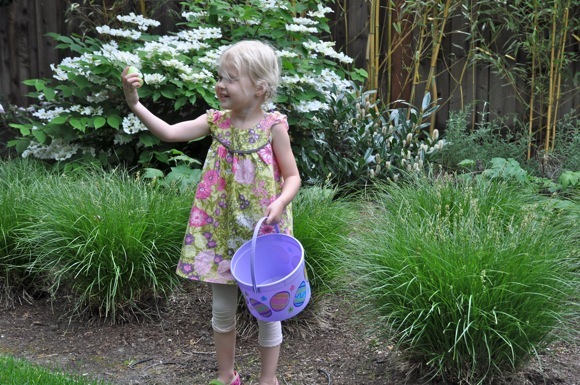 Then back to the house for another egg hunt – the backyard is near perfect for hiding eggs. 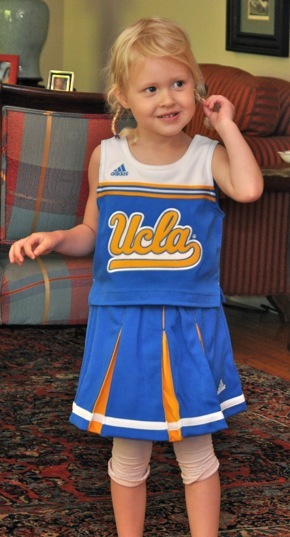 She then discovered that the Easter Bunny had left some Bruin wear for her and soon-to-be-born brother James. After lunch, it was time for the new Easter tradition, be it early or late – time to plant seeds in the Grace’s garden, which made its debut last year and was the activity that she and Grandpa Chrisie shared. All agree – perfect way to remember him. And the best news, Grace really got into the planting. This entry was posted in Grace and tagged Easter 2011. Bookmark the permalink.